Not to be confused with Flame Runner or Flame Rider. The Flame Flyer is a large-sized kart that appears in Mario Kart Wii. Its bike counterpart is the Flame Runner. The Badwagon from Mario Kart 8 resembles this kart. This kart's appearance is similar to a 1970 Plymouth Barracuda due to its front fascia and overall design, its six exhaust pipes (three on each side) and its engine sticking out of its hood. The kart also features flame motifs and bears the Mario Kart trademark name on the tires. It shares its engine sound with the Mini Beast and the Wild Wing. The exact same sound is recycled for B Dasher and Bruiser in Mario Kart 7. The Flame Flyer kart features great speed and weight, along with good drift and Mini-Turbo performing; it is the fourth fastest vehicle (third fastest kart) in the game, with its speed being tied with that of the Sneakster. It is also rather heavy, with its weight being tied with the Standard Kart L and Wario Bike. However, it suffers from poor handling and is tied with the Spear in off-road performance, both having the second worst off-road in the game. Additionally, the Flame Flyer has the worst acceleration in the game. However, if Waluigi or Large Mii uses the Flame Flyer, the acceleration will exceed that of the Flame Runner as both characters receive an acceleration bonus. And if Donkey Kong uses the Flame Flyer, the acceleration will be the same as the Flame Runner. Waluigi's Flame Flyer's acceleration can even exceed that of the Jetsetter's and Wild Wing's by one point. Wario – Purple with yellow and orange flames. Waluigi – Indigo with yellow flames. Donkey Kong – Brown with lime-green flames. Bowser – Dark green with yellow flames. King Boo – Black with pink flames. Rosalina – Turquoise with blue flames. Funky Kong – Red with azure flames. Dry Bowser – Grey with red flames. Male Mii – Yellow with blue flames. Female Mii – Pink with white flames. "It's a muscle car revival! Who can deny the awesome presence of a blower popping out of the hood? The Flame Flyer packs very high levels for Speed and Weight, with lower levels for Acceleration and Handling stats." The Flame Flyer has the same weight and Mini-Turbo as the Wario Bike. It also has the same weight as the Standard Kart L, making them equally the fourth heaviest vehicles in the game. Despite that the exhaust pipes are located on the sides of the vehicle, when the player gets an engine bust, the cloud of exhaust still comes out from the back of the vehicle. 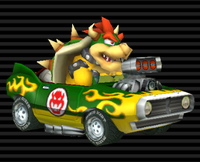 The official artwork of Bowser driving his Flame Flyer depicts him chucking a Spiny Shell with his left hand, even though drivers use their right hand to toss items. If Rosalina, any Mii, or Funky Kong use the Flame Flyer, its speed will surpass the Sprinter's default speed by 1, 1, and 2 points respectively. On the other hand, if used by Bowser will have the same speed as the Sprinter's default speed. Although Funky Kong's Flame Flyer can surpass the Sprinter's default speed by 2 points, it falls short of surpassing the Spear's default speed by 1 point. This page was last edited on March 4, 2019, at 17:38.